Why does Satan persist in his rebellion against God? Doesn't he realize there is no hope in his attempt to dethrone the Creator of the universe? Satan may be the great deceiver, but he himself is the most deceived being in the universe. There is no deception greater than self-deception, and Satan has convinced himself that he can ultimately triumph. But he is doomed. No matter what he throws at God, it will be tossed right back into his face, and it will be converted to the glory of Jesus. Consider the Cross. 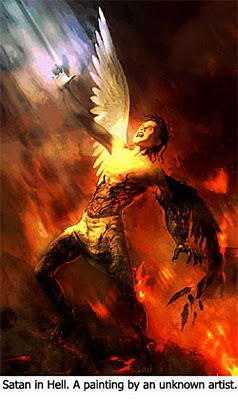 Satan manipulated the murder of God's Son. He thought he had achieved his greatest victory. But through the power of the Resurrection, God converted the most dastardly act of history into one of history's most glorious events. Satan has got to be the most frustrated creature in all of God's creation. It is no wonder that Psalm 2 tells us that while Satan plots and schemes against God and His Anointed One, the Creator sits in Heaven and laughs! (Psalm 2:4). His laughter is not motivated by a lack of concern. He laughs because He has the wisdom and power to orchestrate all the evil of Satan to the triumph of His Son. Truly I will bring it to pass.